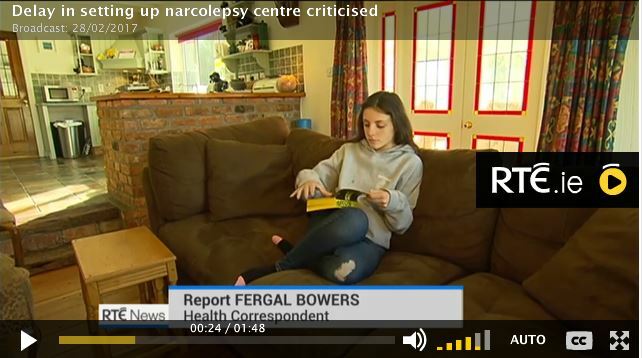 SOUND member Lauren Kavanagh and her father Larry spoke on RTE news last night about the impact of narcolepsy on their lives. Lauren is one of 80 people who developed narcolepsy as a result of the H1N1 Swine Flu vaccine Pandemrix. In the report by Fergal Bowers, they highlighted the need for funding for a sleep clinic in St. James' Hospital that would help young adults to cope with the lifelong neurological condition. In recent months SOUNDS has lobbied TDs and Senators to ask a series of questions in the Dáil about fudning for the clinic in St. James' Hospital. Despite this and the work done directly with St. James' Hospital to secure funding no provision was made for it this year in the government estimates. Minister for Health Simon Harris TD has said publicly that he will meet with SOUND in the coming weeks to discuss their concerns over the funding and the delivery of health and education services to sufferers. About the Author: Barry C.